If you have made the decision to have one or more dental implants placed, you may have been told that with proper oral hygiene, implants can last a lifetime. That might have you wondering, what exactly is proper oral hygiene for dental implants? Winterholler Dentistry & Implant Surgery is here to share the best care practices and oral health concerns regarding your new implants. 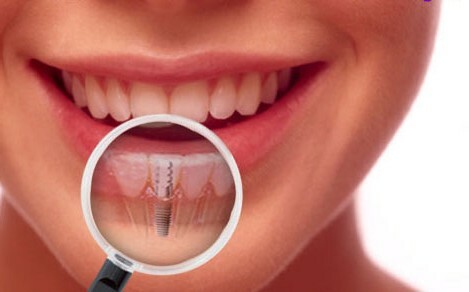 Implants are most successful in mouths with healthy gums and enough bone to support the implant. If you have gum disease, your dentist will suggest a treatment plan to get your mouth healthy enough for your implants to thrive in. Before placing implants, your mouth will be cleaned with an antibacterial rinse to decrease risk of infection and clear existing plaque buildup. This rinse will also be recommended after implant placement for a period of time. When you think of oral hygiene, you likely think of brushing, flossing, and mouthwash. Hygiene doesn’t change all that much for implants in concept, but some of the details are altered. Below are some differences you’ll need to consider for your new oral hygiene routine. You should continue brushing at least twice a day and always before bed so that bacteria doesn’t thrive in your mouth during the night. Talk to your dentist about an Interdental brush that will get between your teeth and in hard to reach spaces around your gums. Having a brush that is the right shape and size goes a long way in eliminating plaque. There are electric toothbrush tips designed for implant care. If you have a manual toothbrush, getting one with the right type of bristles is imperative. Depending on the placement of your implants and bridges, it may be difficult to floss effectively. Your dentist can recommend floss specifically for implants because it is important to use one that won’t fray and leave debris in your mouth. This can increase the risk of infection or plaque buildup around the implant. A WaterPik or another oral irrigator may be an effective solution if flossing your implant is difficult. If you have had issues with grinding your teeth, you may be familiar with wearing a night guard while sleeping. With implants, a night guard may be recommended to prevent bone loss. These steps will help ensure your new implants will last a lifetime. If you have more questions regarding dental implants, oral hygiene, or your dental care in general, please call us today to schedule a consultation!